The Department of International Development Studies aims to foster greater understanding of social justice, human rights, and equality, both globally and locally through study, research and cross-cultural learning experiences. 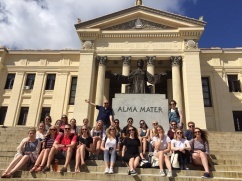 Offered through the Faculty of Arts and Social Sciences, International Development Studies gives students an interdisciplinary education at the undergraduate and graduate levels. Our students draw upon a wide range of subjects to tailor their degree programs, including biology, comparative religion, economics, language study, political science, sociology and social anthropology. Learn more about our Undergraduate and Graduate programs.